As you can probably gather from the topic title, I wasn't entirely sure, myself, which forum sub-section to start this thread in. PLEASE DO NOT FLAG CURRENT AUCTION LISTINGS - unless, like one example I'm about to include, they're grossly over-priced. As some of you may already know, this is a particular area of interest of mine, so I'd rather not have it broadcast to the world. By all means, if you think you've found a Yema N8, I might be interested in (and may have missed) - please send me a PM instead. 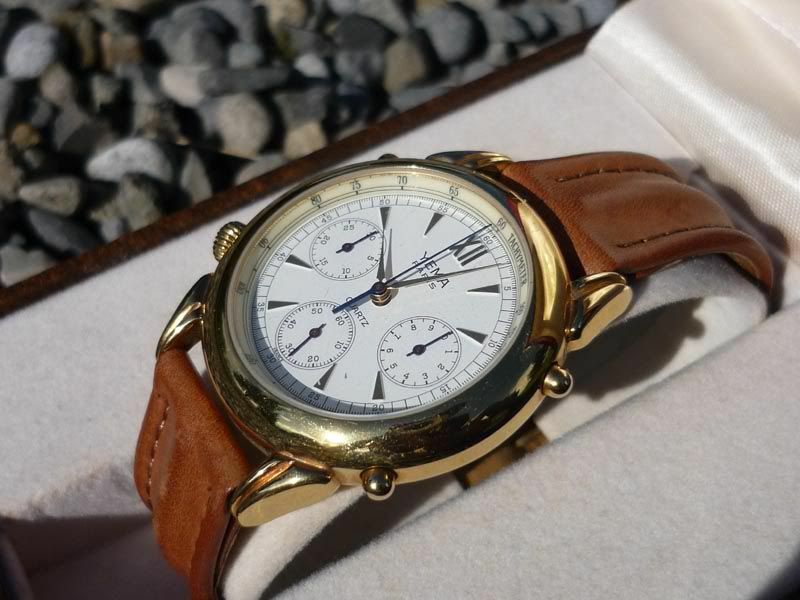 Belle montre chronograph de marque yema,entierement revisée pile verre et bracelet neuf,tout acier en parfait etat de marche. 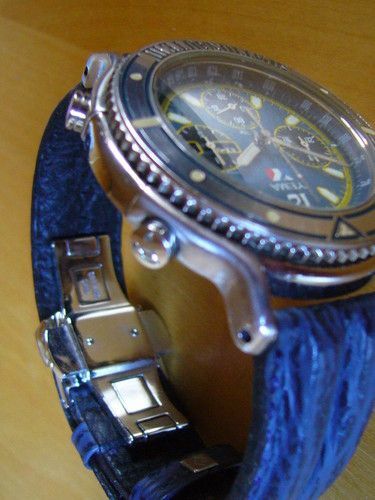 .... the one with the ridiculous ¥49,800 Yen opening bid price - except that the eBay France N7 is fitted with a Jubilee-style bracelet. Goes without saying, that as soon as I saw it, I sent a link to 7A28 collector Mark Mills. He acknowledged receipt a day or so later. Mark said he might go for it, but also gave me the impression he felt it was too similar to the gold-plated Yema N7 he already had. And the opening bid price on that Yema N7 on eBay France, which went unsold ? 69 Euros. Well what else would you expect ? 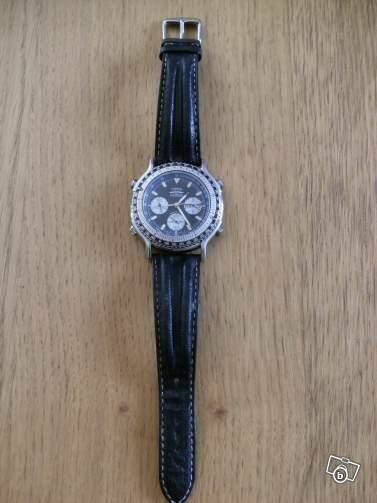 http://www.ebay.co.uk/itm/230763152345 - selling for a mere 50 Euros after 2 bids. This second listing received only 54 views. 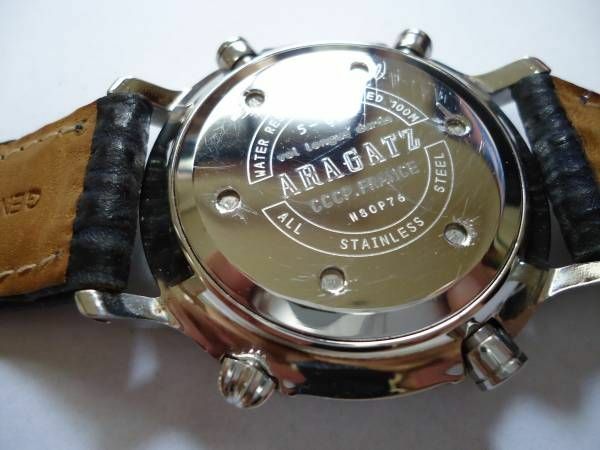 Someone got themselves a nice example of a very different '7A28' for a good price. 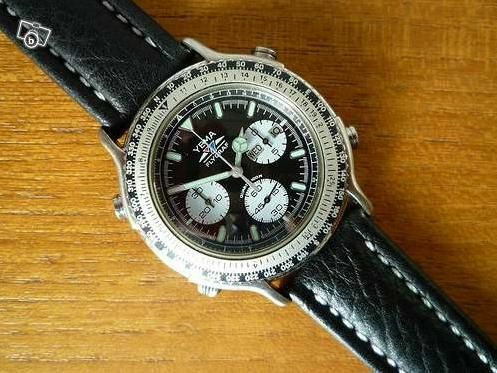 Did anybody else spot this one, listed on eBay this week ? Sold last night for the opening bid price of $125. 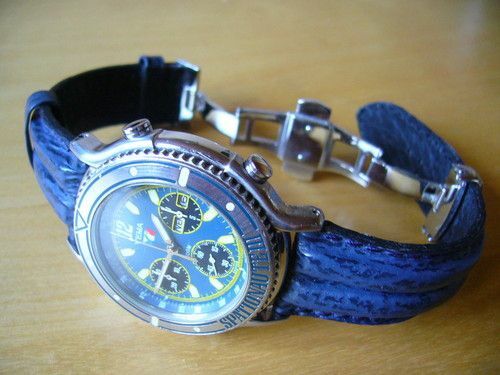 IIRC, it was originally listed with an opening bid price of $150, with a Buy-it-Now option of $200. The Craigslist advert used the same two photos as the eBay listing, slightly larger, plus two extra, which weren't frankly much better. 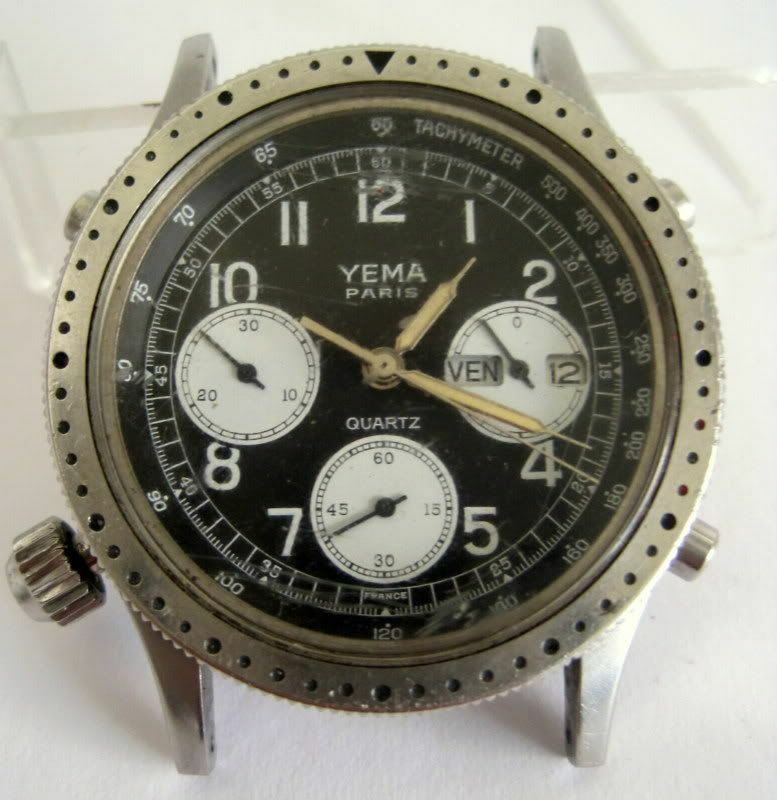 If you didn't realize that you were actually looking at a 7A38, albeit a heavily disguised one, or knew the Yema model number, they wouldn't have been much help. 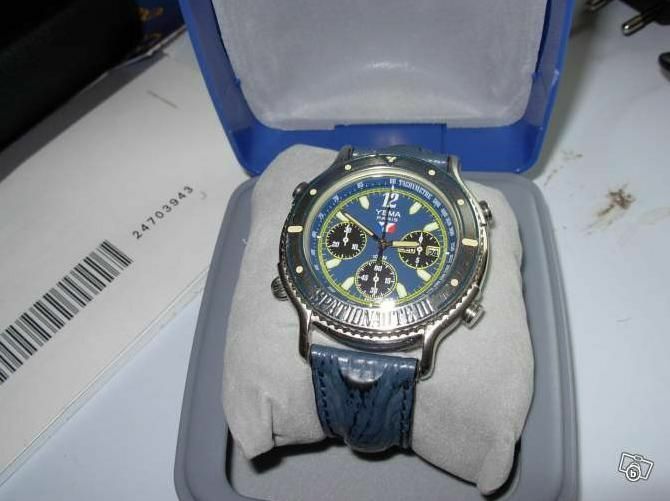 Not a bad price at $125, assuming those out of focus photos weren't hiding a multude of blemishes. 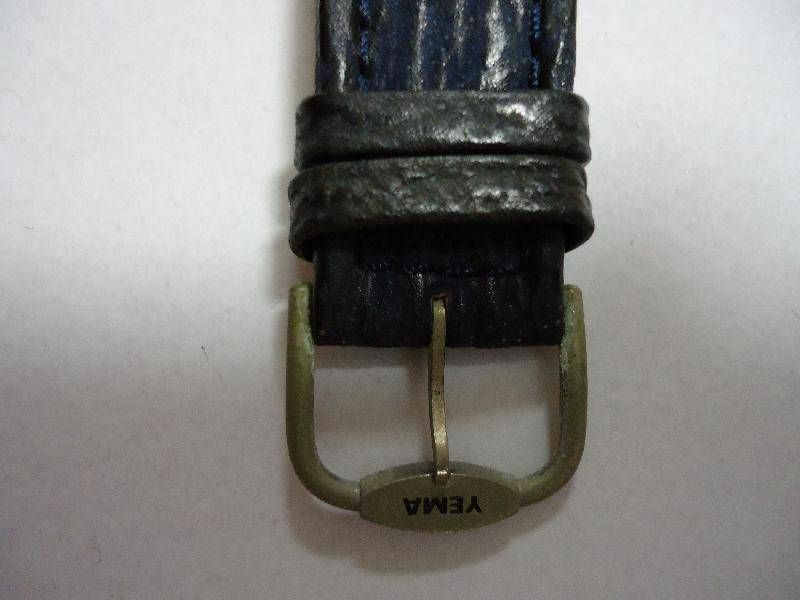 I won't post the photo of my own example (I've only ever taken the one; as I received it, before I replaced the crown and strap). 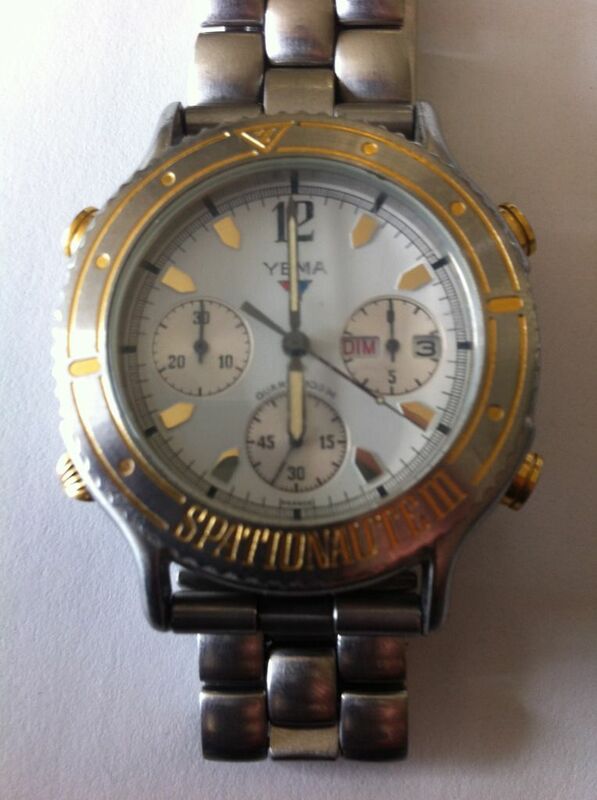 But take my word for it, this gold-plated case, gold dial version of Yema N81W63 is, sans doute, The Absolute BlingMeister 7Axx. 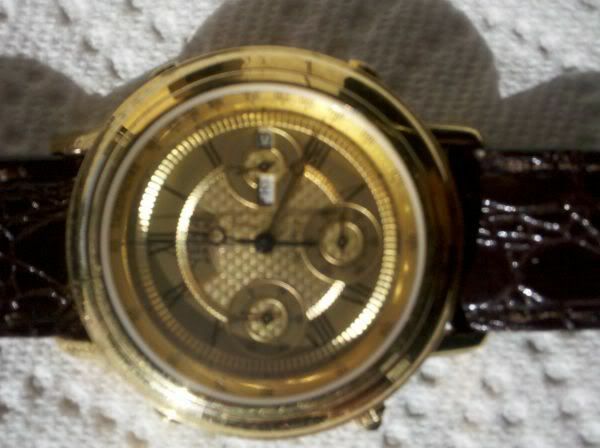 It's pretty much a blatant rip-off of the classic Breguet Classique chrono' s design, complete with fluted watch case; guilloché dial face (including the layout of the printing) pomme hands, cabouchon crown, etc.. About the only feature which the Yema is missing are the drilled screw-on strap lugs. If you're not familiar with the subject, then google 'Breguet Classique', and you'll see exactly what I mean, though many of the images returned in the search result will likely be fakes. 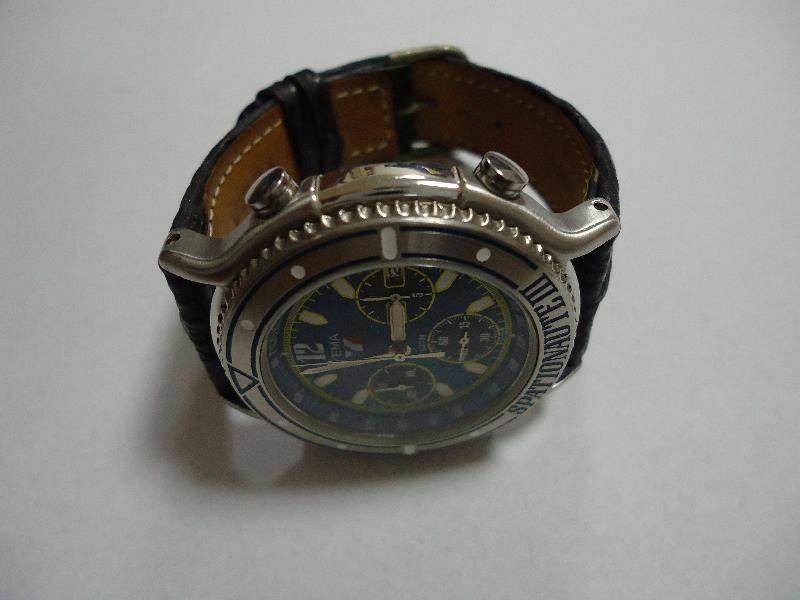 A Stainless Steel and Gold Plated Wristwatch, YEMA Paris, with gold plated dial, black Roman numerals, sweep second hand, three subsidiary dials, day and date box, tachometer, quartz movement, water resistant, serial #6026 YEMA N81W63 Paris, with black leather band. In original box. A Yema N81X26 'restoration project', which I thought probably better belonged in the 'Bottom of the 7Axx barrel' thread, besides here. 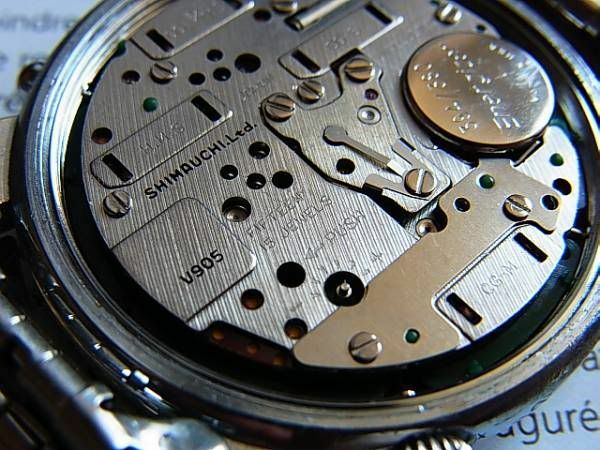 The movement back-plate had localized rust around the screw-heads, indicating probable water damage deeper inside the movement. 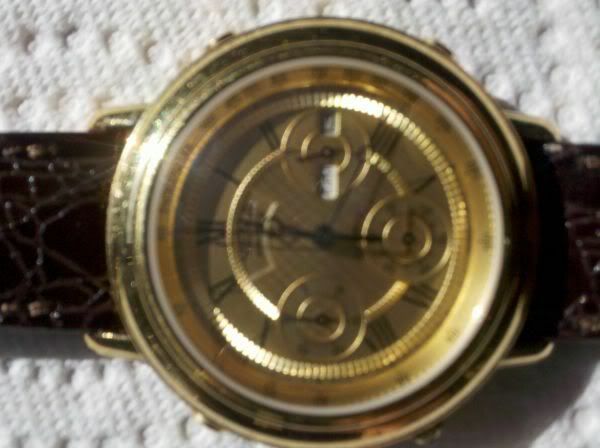 It was also fitted with the wrong case-back, off a Seiko gold-tone 7A28-7029. .... sold for a $63.51 (approx. £39.41) after 8 bids. 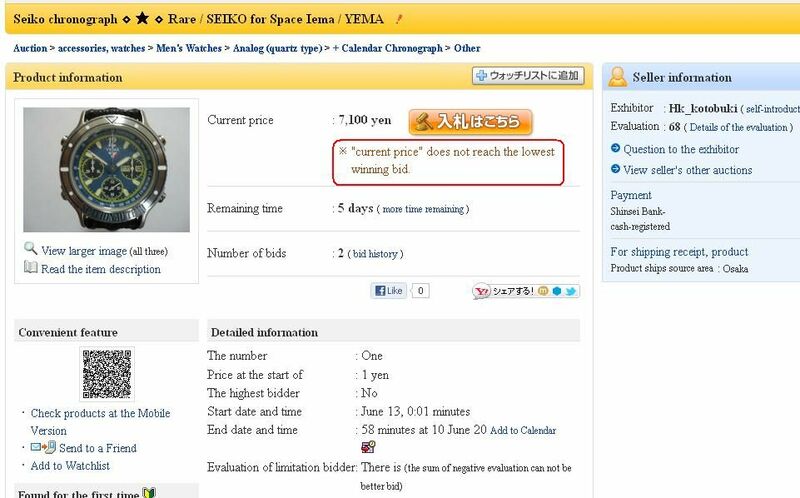 I'm not sure of the full exact Yema N7xxxx model number, but it's obviously the same as the one currently listed on Yahoo Japan. 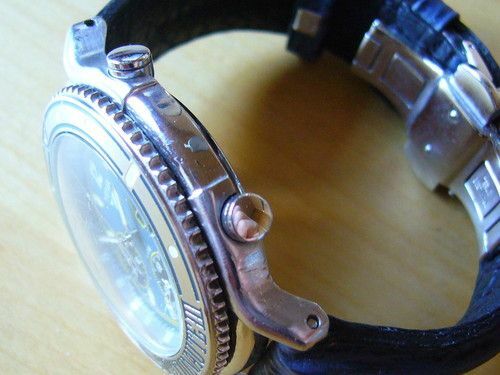 Neither at the time, was I sure whether the Jubilee-style bracelet fitted was original to the watch, or a later personalized fitment. 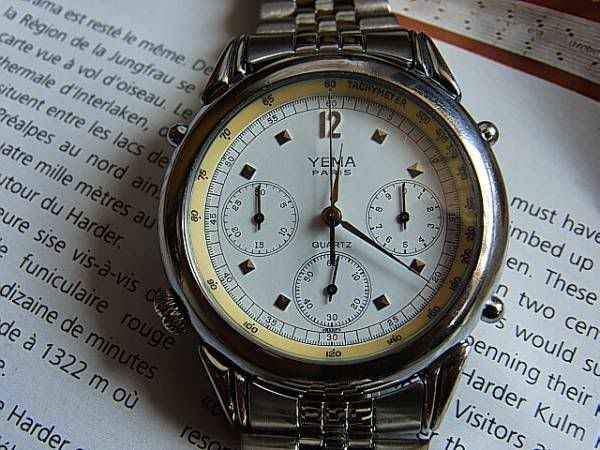 Although I think YEMA were in the Seiko group in the 1980s, and now and they separate again, perhaps at the time incorporating advanced technology of Seiko, has also sold chronograph like this. 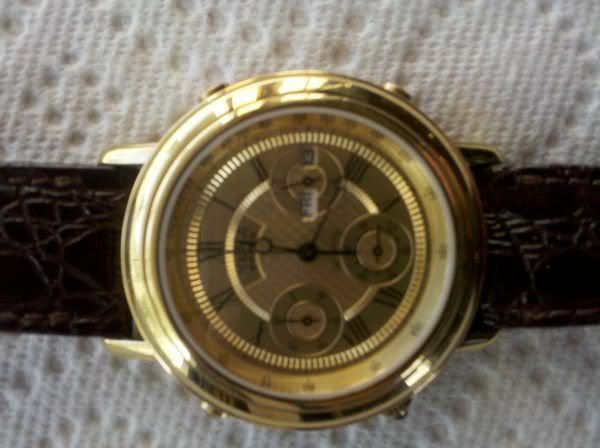 Caliber of this watch, as far as compared to in the picture, seems to be the same as the Seiko 7A28. 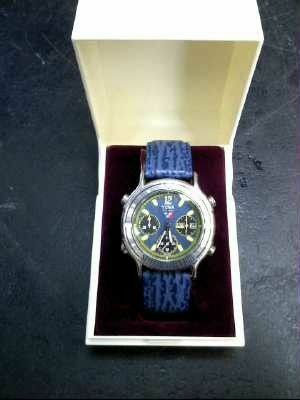 In other words, the world's first quartz chronograph, quartz caliber luxury specification is 15 jewel. 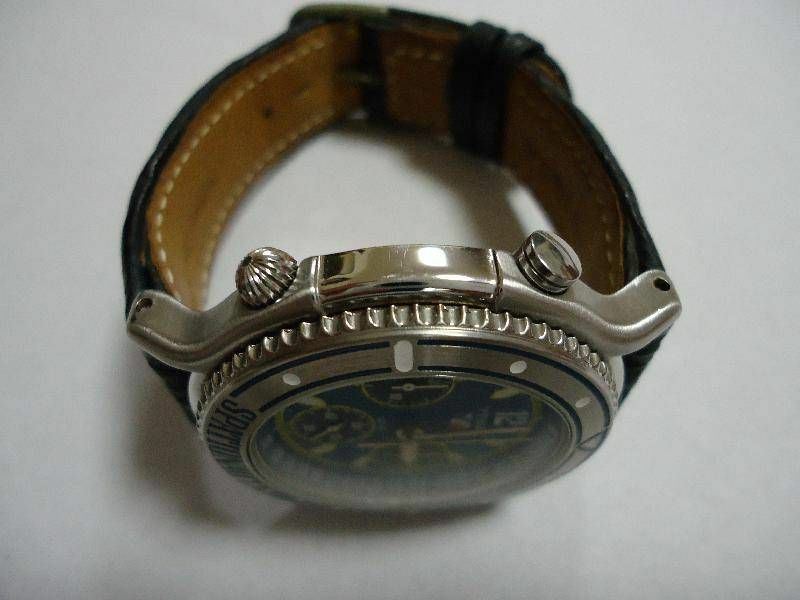 Seiko watch you think of any other brand, do not use the same part number, perhaps, and is wearing a different name to the same caliber 7A28. 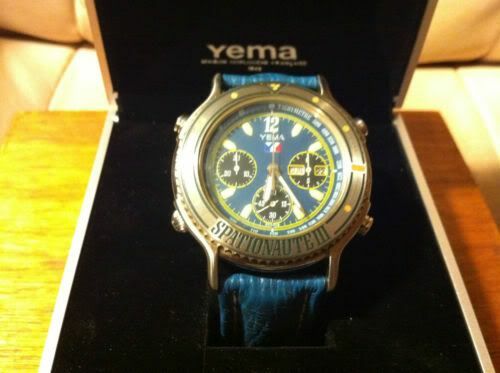 An eBay auction just ended a couple of minutes ago, for my favourite Yema N8 - a 43mm Spationaute III. 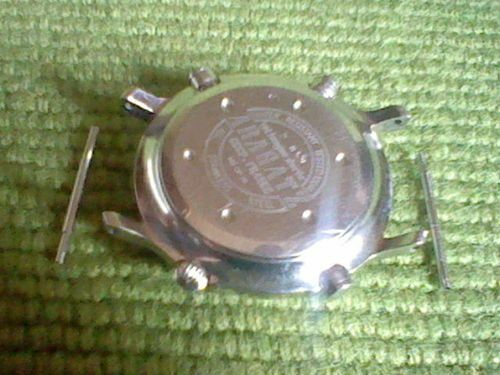 JOLIE MONTRE DE MARQUE YEMA SPATIONAUTE III, EN TRES BON ETAT DE MARCHE ET ESTHETIQUE ( PORTEE UNE SEULE FOIS, LA MONTRE POSSEDE TOUJOURS SON BRACELET D'ORIGINE( A CHANGER CAR CRAQUELE DU A SON AGE, VOIR PHOTOS) AINSI QUE SA PROTECTION DE FOND A SIGNALER UNE PETITE RAYURE AU DOS DU BOITIER . It was described as 'Used', but in 'very good condition'. 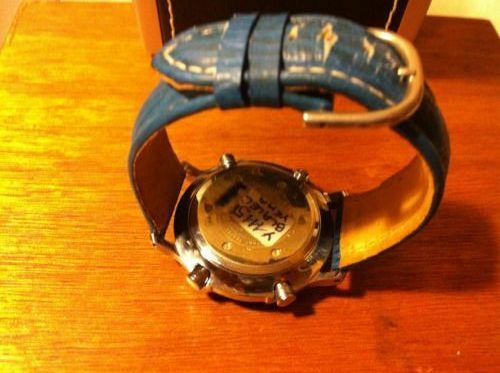 I personally doubt whether the strap, or the box it came with were original. 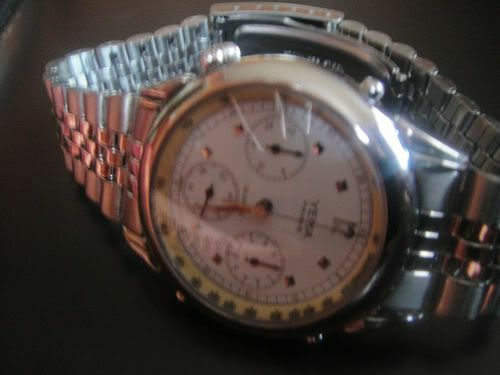 Despite that, it sold for a healthy 277.75 Euros (approx. £225.42) after 29 bids, ending in something of a last 10 second snipefest. 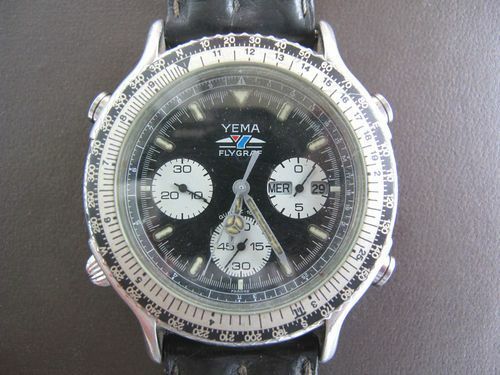 Belated edit (added on 23rd October): Purely of interest to any fellow Yema N8 aficionados, the hand-written paper sticker on this watch's case-back read Y1115 - which, as I'd later learned, was the Yema catalogue sales code for the N80P76 Spationaute III. 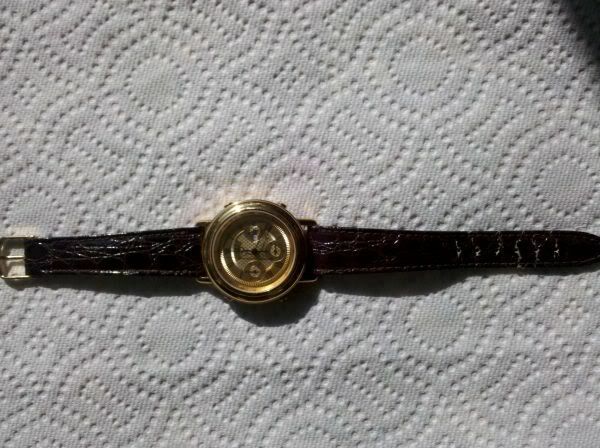 bracelet en cuir. posez vos questions avant la fin des encheres svp. 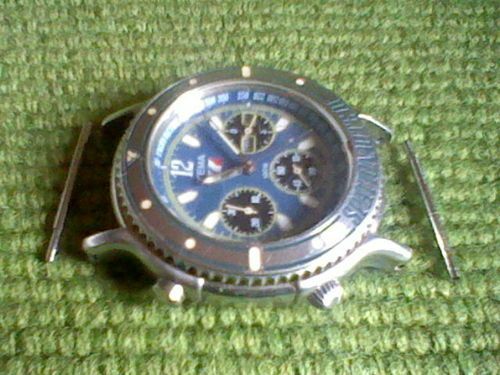 Probably one best avoided, IMHO, given the obvious deterioration of the dial and hands lume, cloudy crystal, and floating debris. 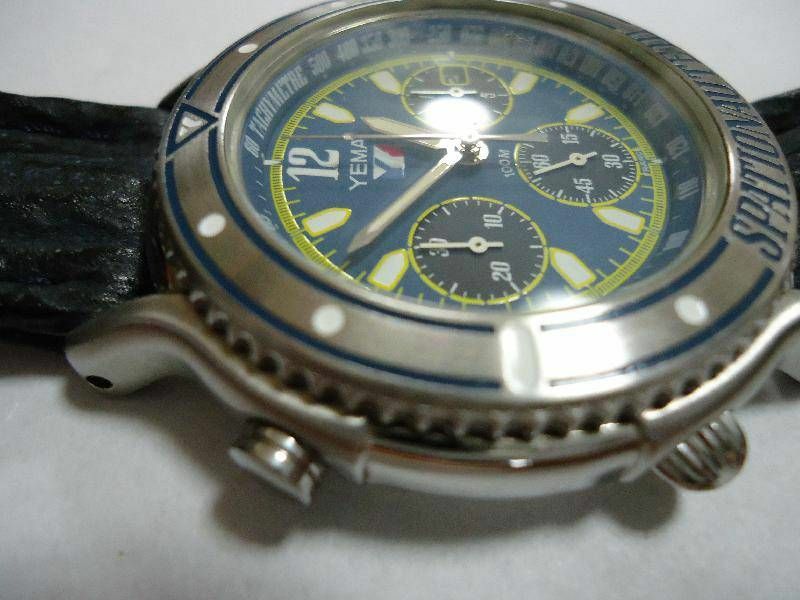 The seller was presumably aware of what might potentially lurk inside (water or battery acid), because he'd specified 'No Returns'. 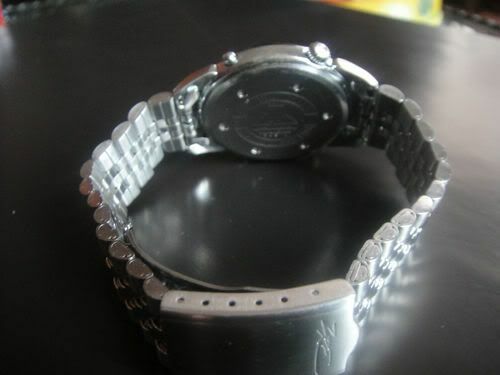 Despite that, it still made an impressive (given the apparent condition) 258.00 Euros (approx. 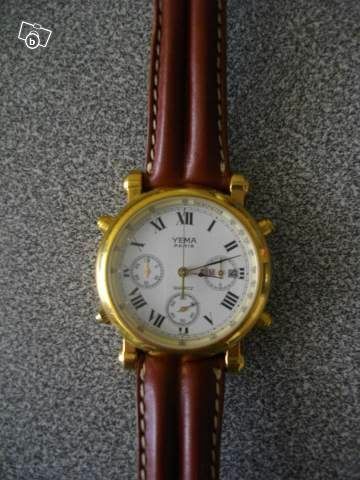 £209.41) after 11 bids !! Incroyable. MERCI DE ME CONTACTER PAR TELEPHONE OU PAR EMAIL. FAIRE OFFRE RAISONNABLE MODELE PLUTOT RARE DANS SA VERSION FOND BLANC. Reason I have the large photo, is that the seller contacted me in the first instance (through Chronomania), asking if I was interested. 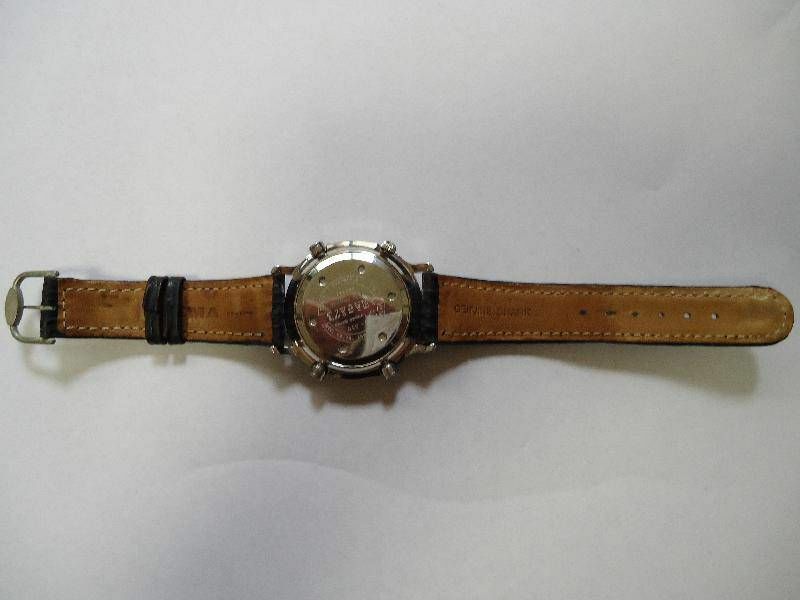 Montre Yema chrono - à pile (installée) - n°2150 -N 81 W 43 - water résistant 50m - bracelet cuir - parfait état . 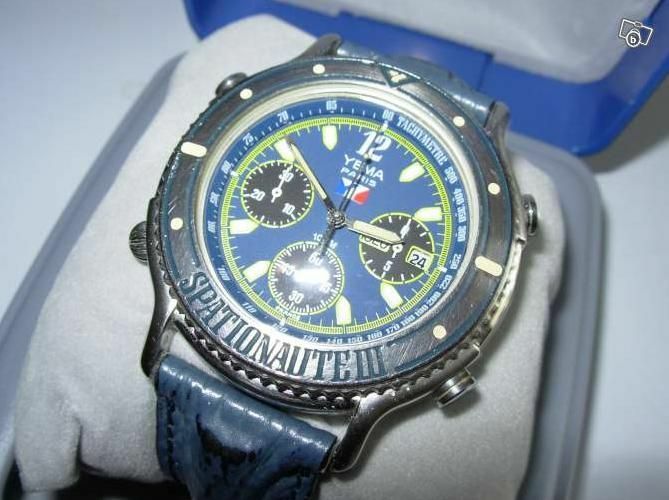 Still at the same highly over-optimistic 280 Euros asking price. -Boîtier : parties apparentes en excellent état. Le fond comporte des rayures et les inscriptions sont très estompées. -Lunette en parfait état. Tourne sans problème. Inscriptions bleues sans défauts. -Verre d'origine comportant quelques rayures ne gênant pas la lecture. -Cadran: parfait état. Index non lumineux. -Mouvement: Tous les modes fonctionnent parfaitement. Couronne vissante et poussoirs d'origine en parfait état. Pile neuve. Excellente précision. 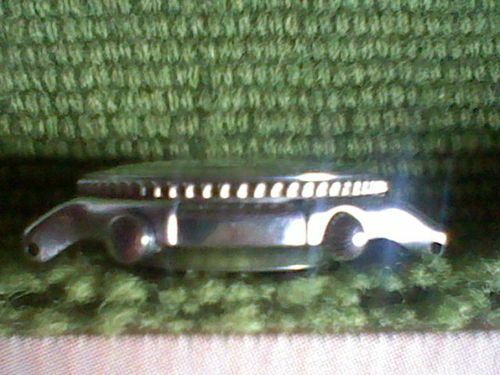 -Bracelet: neuf en requin dans le même style que l'original (excepté la double nervure) avec boucle déployante. The other, in possibly better condition, currently remains unsold. It's listed on LeBonCoin.fr. 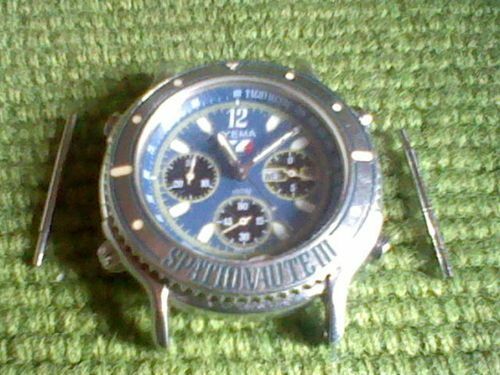 The seller has mis-spelled 'Spationaute' without the 'e', and, as he won't either accept payment by PayPal, nor ship outside France - it's academic, as far as I'm concerned. Mise en ligne par guy le 28 mai à 07:43. 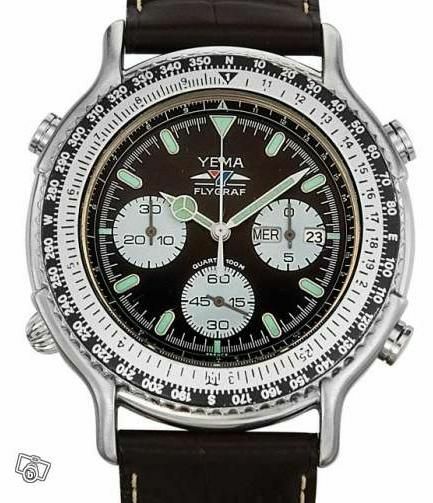 Note this one has slightly different dial printing to the 2 previous eBay examples, with 'PARIS' between YEMA and the tricoleur 'Y' logo. Edit: It was also offered on Chronomania, with larger versions of 2 of the same photos. Later on 2nd June it was showing as 'on hold'. Contrary to appearances, I would like to reassure the readership that my Yema N8 Flygraf is NOT for sale on LeBonCoin. Mise en ligne par philippe le 3 juin à 14:47. 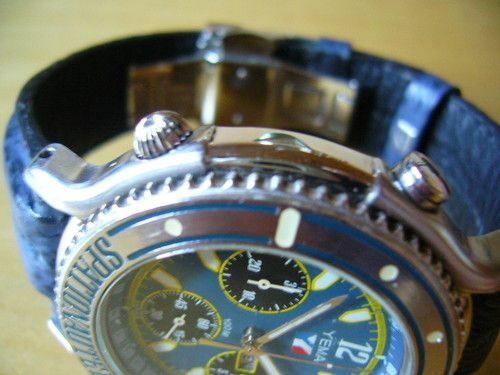 The photo was 'borrowed' from my Flickr album: http://www.flickr.com/photos/seiko_7a38/5400888309/ by a cheeky French seller ! 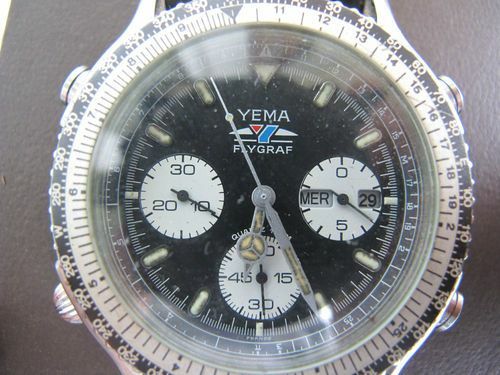 Mise en ligne par philippe le 11 juin à 09:26.
although that image originally came from the 'historique' section of the Yema website, and again is actually of my (first) Yema Flygraf. 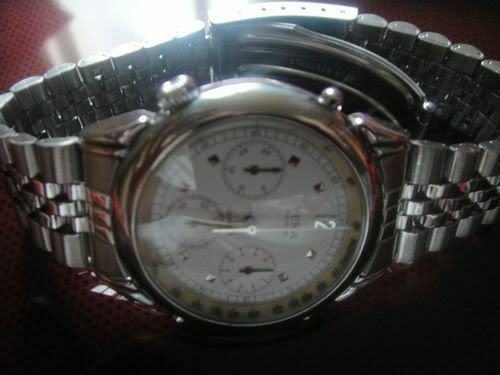 The seller has reduced his asking price from 450 to 390 Euros. Try knocking another 200 off, Philippe, and you'll be getting closer. 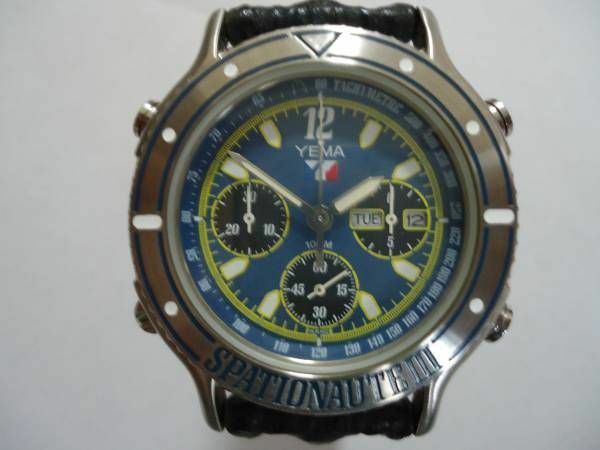 There seems to be something of an overabundance of 43mm Yema Spationaute III's on eBay and elsewhere lately. mais livrée avec ses 2 anses d'origine. son poids faits 7O,30 grammes. remise en main propre sur strasbourg possible. 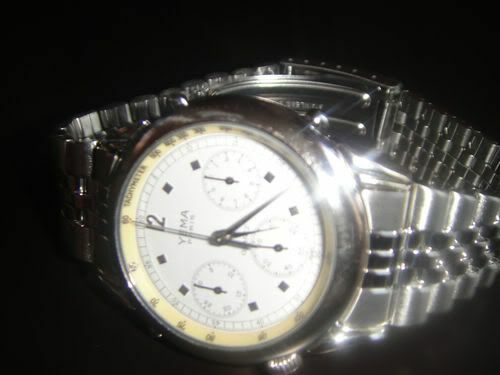 It sold for 113.00 Euros (approx £90.54) after 20 bids. I know what I wrote about not linking current auction listings, but I now realize that the outcome this one is likely to be academic. 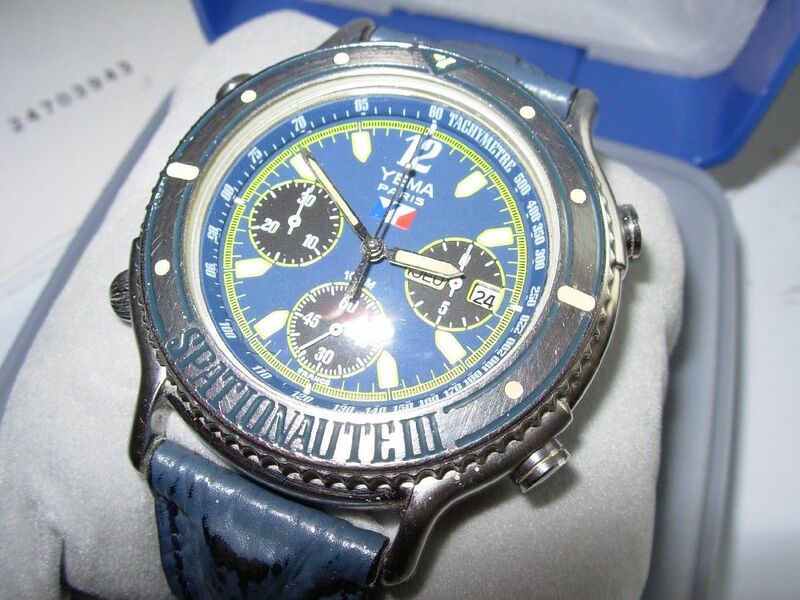 Listed yesterday evening on Yahoo Japan was a used, but tidy-looking 43mm Yema Spationaute III on its original navy shark strap. My immediate thoughts were - Wowee - potential bargain (even if ultimately I might have to bid as much as 20,000 Yen to win it). Remembering I'd paid 19,800 Yen (equivalent to $250) for the nice example I bought on Yahoo Japan auctions last December. (exhibit commercial model, not a prototype). 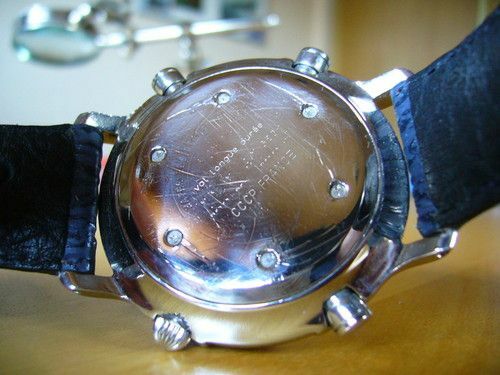 For the universe's first analog quartz chronograph, Yema's challenge was to overcome the many harsh conditions faced by astronauts in outer space. 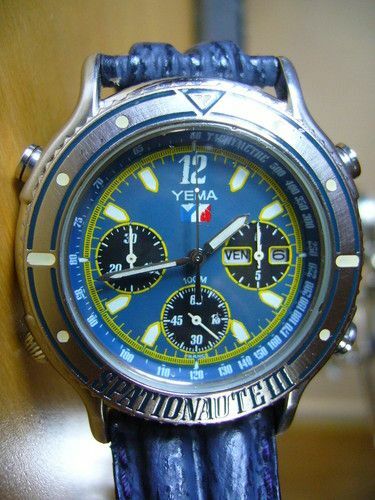 Company Yema of France has been asked to design and manufacture a watch for space flight France-Soviet ARAGATZ is to pass the conditions extremely difficult, and create a project team of academic research and development across the board, its most came to pass the toughest standards. 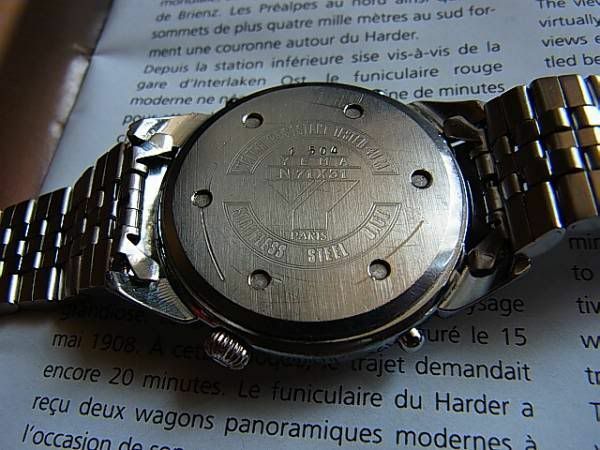 And its reference, it features chronograph time and everything is analog, with respect to how to use shape and that sufficient consideration ergonomically have been, the main features by the paint-emitting radioactive even when there is no light source around that reading is possible. Besides this, the test was carried out in every conceivable harsh physical conditions of course. 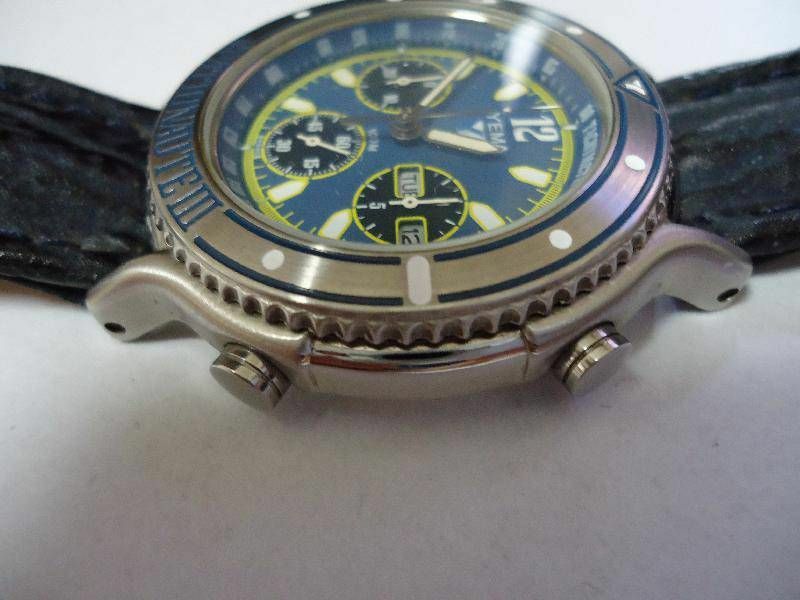 The commercial model has a stainless steel case, a slight modification of titanium for the case of the prototype, but is, instead, there is little performance is basically the prototype. Yema following have been accepted from the house is always a technical challenge many adventures, of the universe or what is waiting for them. Price 140,000 yen. It appears that the seller has set a reserve price - something which wasn't immediately apparent, before when there weren't any bids. 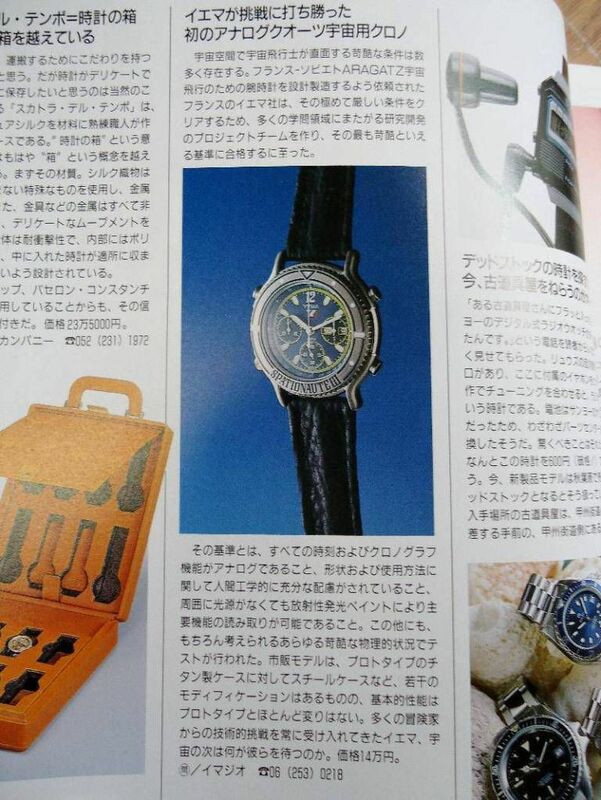 As the seller is aware that the watch sold for 140,000 Yen back in 1992, I suspect it will be set at something suitably astronomic. They're asking a reasonable 140.00 € for it (no other details are included in the advert) .... but check out the second photo. Problem is, it's in their Lescar outlet in Pyrénées-Atlantiques, in south-west France, and they don't offer any mailing service ! Somehow, and I'm not sure of the mechanics, but before the auction ended, the seller managed to bump the price up to 20,000 Yen. - because it's just been re-listed: http://page18.auctions.yahoo.co.jp/jp/auction/w75720330 - with an opening bid price of 22,000 Yen. Although 'it's still all Greek Japanese to me', I think I'm gradually gaining a better understanding of how Yahoo Japan auctions work. In fact, although the auction was only bid to 7,100 Yen (with the reserve price not met) at the end, he didn't bump it up to 20,000 Yen. What I believe happened is that Yahoo automatically showed what the reserve price was set at - just as the auction was about to end. 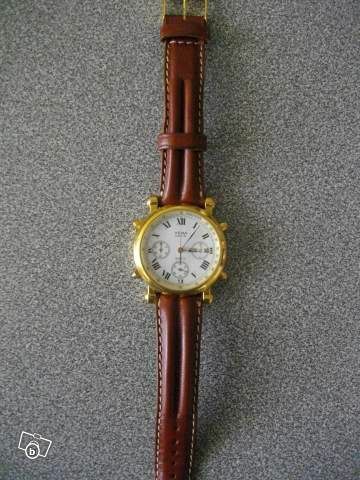 The auction was due to end at 14:20 UK time today, but didn't. 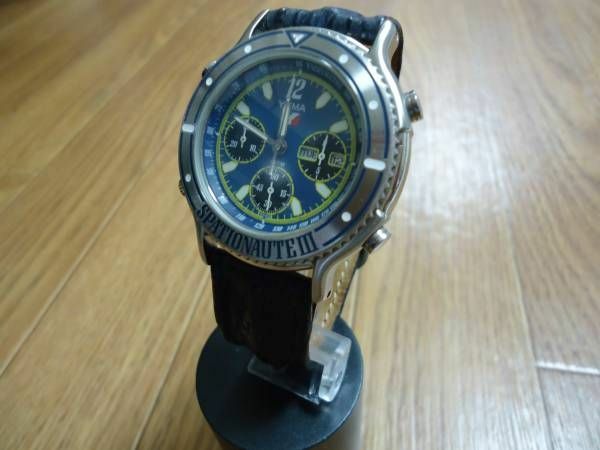 Due to a second bidder placing a bid in the last 5 minutes, the auction was extended by 10 minutes, and then a further 10 minutes, until bidding stopped at 25,000 Yen after 7 bids (equivalent to £201.30). A few months ago, I started a thread in this section entitled: I really didn't need another Yema N8 Flygraf .... It still holds true. So if anybody fancies one, and wants to risk dealing with a French seller (without the safety net that eBay provides) - be my guest. Mise en ligne par François le 6 juillet à 14:07. Note the last part - very unusual for a French seller - but as always, Caveat Emptor - you have nothing like eBay buyer protection.